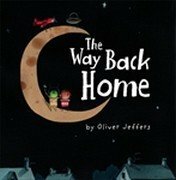 Oliver Jeffers Review: The Way Back Home. Oliver Jeffers Review: The Way Back Home is a fantasy story written for young children. The story features many fantastical events that are enjoyably absurd and whimsical. I think just about all the rules of physics are broken, and it can be fun and revealing to ask young children their views on the events depicted. In the story, a boy finds an aeroplane in his cupboard, if you please, and takes it on a test flight. The plane rises higher and higher and higher till the boy is flying in outer space. Which is quite a feat, as the plane has an open cockpit and the boy is exposed to the...er...elements. But it's ok, because the boy is wearing a leather jacket, a scarf, and goggles to protect him from the cold. While happily flying in outer space, the inevitable happens; the boy's aeroplane runs out of petrol! He is forced to make a landing on the moon. This presents a problem, as the boy has no means to fill his petrol tank. The Way Back Home is a highly original space odyssey that fully engages young childrens' imaginations. The lush, double page, watercolour illustrations feature stick figure like characters that children can relate to. As a language teaching tool, the Way Back Home features many amusing absurdities, which are a rich vein to mine. The absurdities range from the boy flying in outer space, without a spacesuit, to having a rope lowered from the moon to a mountain on Earth, for the boy to clamber up. As an extension activity, a great idea is to use age-appropriate books about space travel and the solar system. The real life information helps to provide a reference for the reader. If the child has some knowledge about the relative positions of the Earth, the Moon and the planet Mars, it helps them to better appreciate the absurdities in the story. The Way Back Home is recommended for younger readers, age 5-7 years.